This week as I was looking out my kitchen window I saw that our magnolia tree had presented us with a beautiful gift. As I admired the creamy white blossom, my eye was drawn to a second flower, shown below. Clearly this second flower was past it’s prime, and yet in my mind it was equally beautiful in its own way. This set me to thinking about how gracefully we humans age, and how we perceive beauty in ourselves and others. As I was enjoying my quiet moments with the blooms a movement on a nearby palmetto tree caught my eye. It was an energetic little red-headed woodpecker probably seeking its breakfast as I was enjoying mine. My thoughts turned to the simple yet beautiful scene in front of me, and the importance of preserving nature’s gifts for generations to come. After all, is that not the most important inheritance they will have? 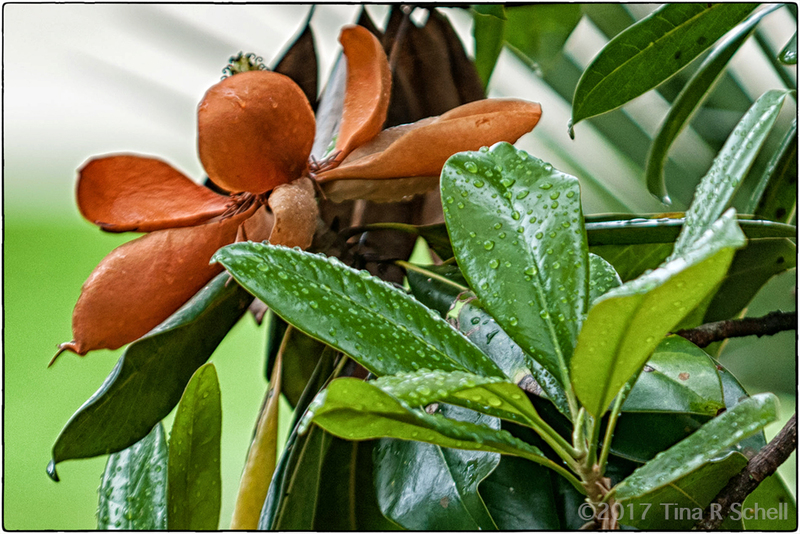 As I moved from capturing the silhouette of the bird I noticed a fallen magnolia leaf below my window. 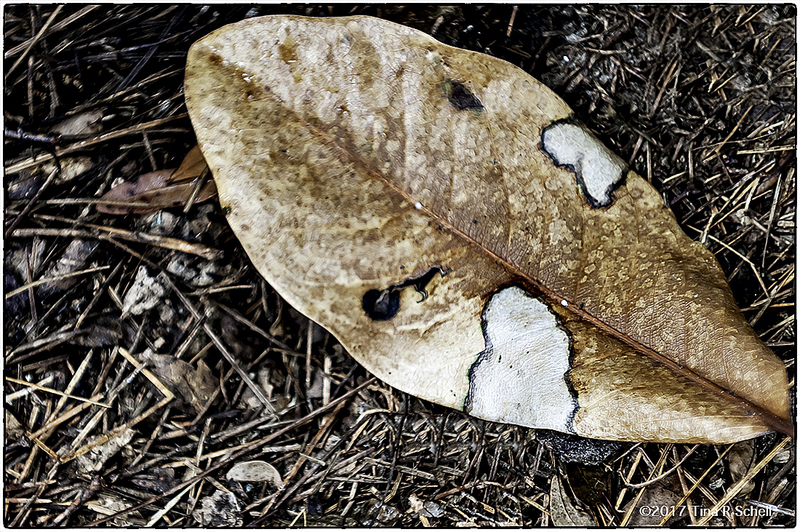 The leaf clearly showed signs of its demise but also maintained an element of beauty in the patterns and colors it displayed. I was reminded of what a remarkable world we live it, and how important it is to notice the small things that make it so. Let us hope our children and our children’s children can say the same thing. You’re a master at linking concepts, words and images together. 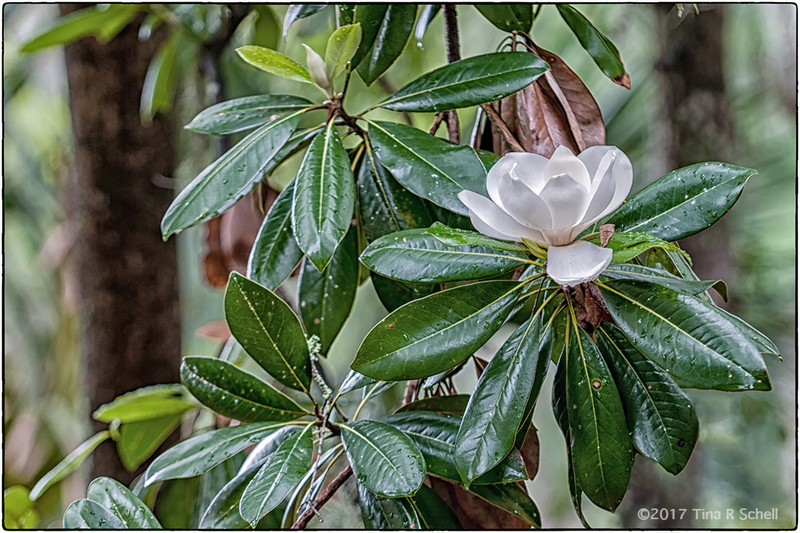 And aren’t magnolias wonderful subjects – leaves and flowers alike? But the woodpecker silhouette – that’s a knock-out, Tina! I hadn’t seen your post before I put mine up. I always love your quotes and decided to borrow that idea as I put mine together. Love your thoughts and photos! No worries Lindy – Imitation, as they say, is the sincerest form of flattery! loving the detail in these ….beautiful words…as always!!! A lovely reflection on this week’s challenge. Happiness reading the quotes and seeing such lovely pictures, loved this one too as always. The black and white pic is amazing. Thanks for sharing Tina 🙂 . Thanks so much Ashu – seems to be the favorite this week. Mine too! Hi Tina, hope you are well? I just love the Woodpecker photo, it’s very unique – it caught my eye right away. All the best! Hey there Mark – great to hear from you! Glad you enjoyed that one – I had some fun with it! The Earth is indeed the most preciousinheritance the future generations will have. A beautiful post, Tina. Thanks Tiny – I know you are focused on preserving habitat as well. Love the silhouette shot Tina and the quote that goes along with it…perfect! Seems like you had a wonderfully mindful morning allowing your thoughts to be guided by what opened up in front of you – those are the best mornings! They sure are Annette! Here’s to being aware of them! Ponder away GF, you always seem to find an interesting train of thought no matter where you begin! If only, Inger! But we can hope, can’t we?! Thanks Andrew – I know you share my pleasure in the smallest delights of each day. Such a beautiful post Tina and deeply thought provoking. There is so much beauty in the world yet I am so worried about the health of our planet and what future generations will have. A vignette of beautiful photos & words woven together. Unique awesome woodpecker take. Great eye & mind as always!! LOL, no, I didn’t draw it Mabel. I shot it in color and then played with it in B&W and liked this version. Glad you liked it! It was a lovely morning indeed :-). Appreciate your visit and comment. Isn’t it beautiful when your thoughts flow from one little moment to the next. Your photos are also beautiful, and I especially love the woodpecker. Great post, Tina. I especially like the silhouette. Woody does it for me as well. Some of my favourite quotes! Divine pictures as usual – my favourite is the wood pecker. Thanks Kimball – especially after a landmark birthday, no? 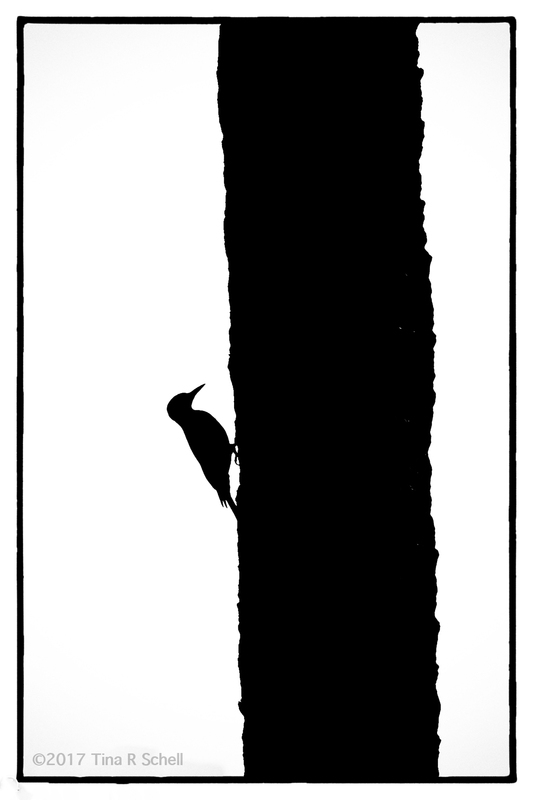 Especially love the woodpecker silhouette! I skipped the aging gracefully and just flat-out fell into old age! I love the silhouette, too, Tina. Although I very much like the Berry/whoever quote, at my stage of life, the Renard quote has much more relevance. 🙂 Thanks for sharing both photographic and written beauty again this week. Also, I have a question for you. I’ll ask it by email. Tina, your silhouette of the woodpecker is divine. Berry’s quote is one of my favorites that I often refer. The Wendell Berry quote is one of my favorites! Your photos are lovely too! Thanks Jo, not too much at all! Great response to WPC- heritage! It’s different from what I have come across from other bloggers, great work Tina! Thanks Toni, feel better soon! Haha, you and me both, Tina! Beautiful photos. I’m not sure how easy it is to age gracefully. In the early process of aging it is painful but the alternative is not good. I loved all your quotes. Thank you.